All you singletons out there get ready for a radical and fun-filled dating experience when you use the InterracialMatch.com website. With some of the most interactive and vibrant features, you get to know members better and help you narrow down on your one ideal choice. 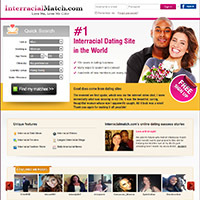 When you log onto InterracialMatch.com, you are using one of the largest interracial dating sites in the world. Started over 13 years ago, it is one of the best sites to help you meet that special someone in your life. All you single ladies and men can create a free profile on this site with pictures and sort through the various profiles to find a suitable partner. If you find someone interesting, you can even send him or her a wink with a one-liner to initiate the conversation. That’s not all, you can even join in a discussion in a group chat room on the site for free. However, if you do decide to register for a gold membership on the site, just know that you will have access to a lot of exclusive features. For instance, if you are looking for someone from a particular location or ethnicity, you can sort through the profiles accordingly. A gold membership also allows you to mail people you find interesting, see who is interested in you and viewed you. You can even search for members based on matching sun signs and chat to them online. If you are new to the field, you can even get dating tips or read blogs and forums of the members to learn more about how online dating works. To avoid any scams, you can even hide your profile photo from specific people. The best part about this site is that, once you have met your match, you can write your story and publish it on the site. This helps other members know that the site is authentic and helps them to understand the process. There are two ways of joining this website. You can either sign up or for free or pay a certain amount and become a gold member. When you register for the website, you will have to answer questions about income, marital status, children, family, interest, habits as well as religion. You then create a profile with your photo, name, country, age, gender, ethnicity etc and then write a short introduction on what you are looking for. The site allows you to upload 10 photos on your profile, even for guest members. You have to pay a certain fee to become a gold member but you can also avail this exclusive membership by referring the site to ten friends. If you are a free member and give the best suggestion on how to improve the site, you can get free access to the gold membership. Gold members are privy to a number of exclusive features, so this may be an ideal option. It takes you one step closer to finding that special someone in your life. If you sign up for a gold membership, you have to a pay a fee of $29.95 for a month. You can also save 50 per cent on the normal fee by taking a package deal and paying $59.95 for three months. If you pay in advance for six months, you can save up to 60 per cent and only pay $95.95. The site uses the trusted GeoTrust for all transactions and you can pay by cheque, credit cards, debit cards or via web wallets like PayPal. InterracialMatch.com has a wide range of features that will help you enjoy a smooth, dating experience. If you are one of those people who can never figure out the ideal place for a first date, you can check out the ‘Interracial Date ideas’ feature. Here you can get tips on where to take your partner for a romantic and fun-filled first outing. From quiet candlelight dinners to walks on the beach to a movie and a sports bar, you can read the suggestions and pick your ideal candidate. You can also meet someone who interests you by using the ‘Let’s Meet’ feature where you can click on the like or dislike button for a person. The person’s photo along with his name, age, gender, location and height are given. If you want people with similar interests to approach you, try the ‘Take Me Away’ feature where you describe yourself and your ideologies. For instance if you play the guitar you can highlight that here along with your favorite song or if you are good at cooking, then you can describe what cuisine you make the best. Basically, you are letting people know what makes you special and why they should date you. Get tips and advice in ‘Interracial Dating advice’ or discuss a romantic notion or idea in ‘Hot Topic’. Find members who are looking for people like you in ‘Reverse Matches’ or find people who match your description in ‘Compatible Matches’. Go straight to the ‘Verified members’ to chat with people who you know are genuine and feel free to share any information and flirt with them as much as you want. Then again, the ‘Interracial Videos’ section lets you upload your favorite videos as well as se other members’ favorite videos. There is also a fashion show section where members can dress up and put on their best attire for you. The site allows has features that allow you to sort through members who find you interesting, who winked at you, emailed you, viewed you, requested your photo or answered your questions. You will always find a few fake members on any dating website who may try to deceive you. But, InterracialMatch.com tries to help you avoid such people by allowing members to verify their pictures, their job and their age. This lets you know whom you are talking to, and allows other people to trust you. To verify your age and photo, you must upload a picture of your passport or driver’s license or be a little more quirky by uploading a picture of yourself with the ‘Interracial Match’ sign. If you are a gold member, you can even hide your profile picture from a certain set group of people. This ensures that only certain people can search and view you on the website. You can also maintain your privacy by inviting only a certain amount of trustworthy friends and members into your circle and use this to interact. You can chat to only these members and allow them to write testimonials for you. For any lingering doubts and queries about the website, you can visit the FAQ section where all your worries will be addressed. For any more assistance regarding the site or any technical questions, you can always contact the 24×7 customer care center. The staff is ever ready to help you out and the customer care center has even received a five star rating from its members. They will help you out with queries regarding becoming a gold member, success stories, dating tips and advice as well as to report any problems or abuse of some sort. You can even send them feedback or look for career opportunities, if interested. You can contact the customer care center on 1-(855)-599-8811(Toll Free) or 1-416-628-1072. This is definitely one of the sites you should look at, when finding an interracial partner. You can sign up for free, check out other members, and wink at them if you are interested. You can even reply to emails from interested candidates. A gold member definitely has more advantages in the sense that you can sort through profiles suing specific criteria like location, ethnicity, astrological sign etc. You can also chat and flirt with other members and hide your profile from shady characters. Along with these features, you also have blogs and forums where you can discuss an interesting topic at length and find people with likeminded interests. You also get dating advice, meet people for the first time, find your ideal match or let them find you etc. It is a user-friendly site, which is easy to understand and helps you find your partner more effectively. The best part about this site is that it is tolerant to all kinds of relationships from straight to gay to lesbian. It also allows equal access and privileges to singe, widowed and divorced women. The package membership fee offers mega discounts and payment is secure and trustworthy. Even if you do not find a romantic partner here, you are atleast sure to find a noteworthy friend or a pen pal with whom you can engage in interesting and lively discussions. You can write testimonials about each other and give good reference for each other. This is one lively, vibrant interracial dating website where you will be entertained for hours and hours. If you are looking for love or friendship, sign up today on InterracialMatch.com and become a part of the online dating experience.